Flag Football is one of the three leadership leagues that clubs run each year. 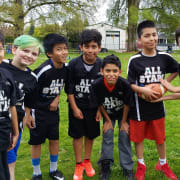 Leadership leagues use sports as a method of teaching leadership skills to youth and follows a nationally recognized curriculum. During the season, there are practices once a week, and games are on Friday. Volunteer coaches are mentors to youth and work with staff to create an empowering environment for all members. We ask volunteer coaches to give roughly 4 hours a week. They will need to be present for practices and games.